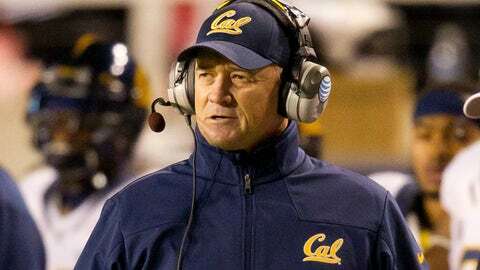 Jeff Tedford completed his tenure as California coach with a record of 82-57. TAMPA, Fla. — The Tampa Bay Buccaneers announced the hiring of Jeff Tedford as their offensive coordinator Saturday. Tedford, 52, led California from 2002-2012 and became the program’s winningest coach with an 82-57 record. He was named the Pac-10 Conference Coach of the Year twice (in 2002 and 2004), and he guided the Golden Bears to a share of the league title in 2006, the school’s first since 1975. Cal also appeared in seven consecutive bowls, from 2003 to 2009, under his watch. "We are very fortunate to have Jeff as our offensive coordinator," Bucs coach Lovie Smith said in a statement. "I have a great deal of respect for the job Jeff did at Cal for more than a decade and I believe he will be a great fit for what we are attempting to do in Tampa." Tedford will be tasked with turning around one of the NFL’s worst offenses last season under former coordinator Mike Sullivan. Injuries to key contributors like wide receiver Mike Williams and running back Doug Martin didn’t help, but Tampa Bay finished 32nd in pass offense (176.2 yards per game), 32nd in total offense (277 ypg), 30th in scoring offense (18 points per game) and 22nd in rush offense (100.8 ypg). Tedford has no previous NFL coaching experience, though he served as an offensive coordinator at Fresno State and Oregon prior to taking the Cal job. "Jeff has a successful and proven track record as a teacher and developer of young talent," Smith said, "and I know our players, and the organization as a whole, will benefit from his experience." The Bucs are bringing in former Minnesota Vikings head coach Leslie Frazier as defensive coordinator, FOX Sports’ Mike Garafolo reported.